#BCTECH Summit and Kootenay House Day 1! KAST, MIDAS and Kootenay House at #BCTECH Summit 2019: The Reality Revolution. It’s been one heckuva day for KAST and the rest of our Kootenay contingent for this, day one of #BCTECH Summit. The day began with a media scrum featuring a brief press grilling of Premier John Horgan directly in front of Kootenay House and the MIDAS ‘M’! New to the Summit for 2019, are six distinct regional “houses”, each housed beneath a metal geodesic dome featuring success stories in their respective regional tech and innovation narratives. 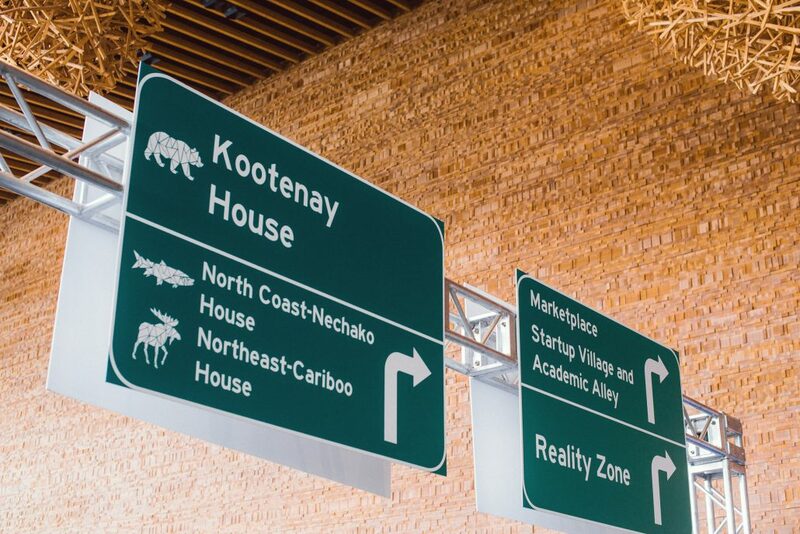 In addition to Kootenay House, the houses include Indigenous / Stélmexw (all of B.C. ), Vancouver Island & Sunshine Coast, Thompson Okanagan, Northeast – Cariboo, and North Coast – Nechako. 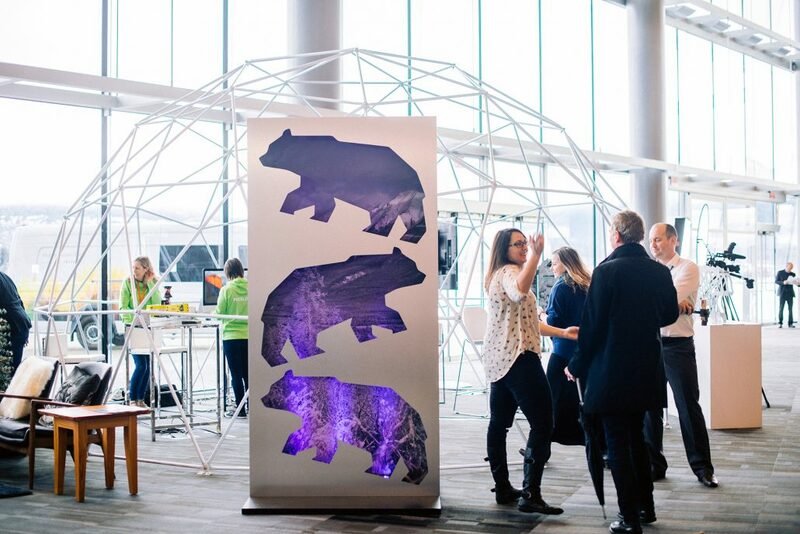 A terrific addition showcasing technology and innovation throughout the province, the regional distinctions are a fun and informative way to see and celebrate how the sector is blossoming beyond the Lower Mainland and even our neck of the woods. 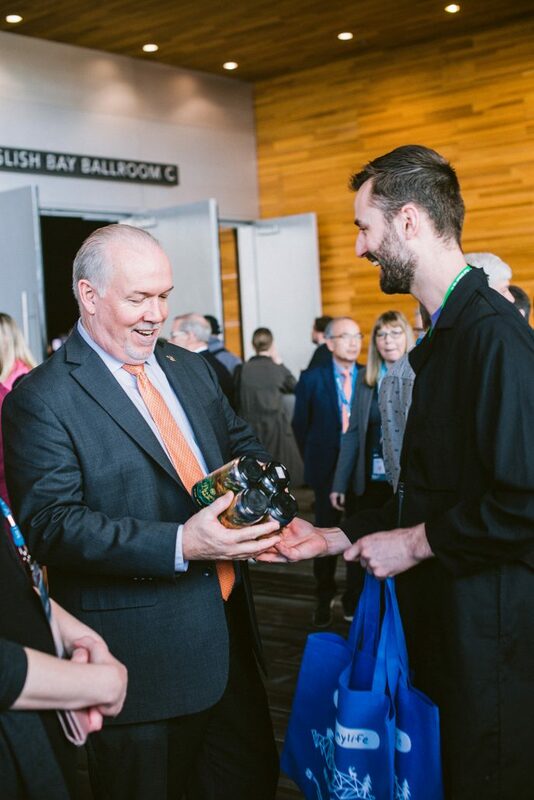 The Premier subsequently made the rounds of the summit, specifically visits to each of the regional houses, before stopping by to visit Kootenay House and chat with KAST Executive Director, Cam Whitehead, who presented Mr. Horgan with some great Koots swag. The premier took time to visit with occupants and entrepreneurs of Kootenay House, Rossland based ThoughtExchange; Cronometer from Revelstoke; Pixel Cents out of Nelson; Kodiak Measurement Services and Selkirk College from Nelson and Castlegar, respectively; and the new Columbia Lake Technology Center from Canal Flats. Throughout the day, Everyone took in the various summits, keynotes, workshops, masterclasses, and networking while also spending time in the Marketplace, a space loaded with tech and innovation resources, and information an inspiration. After a great day of networking and hosting visitors to Kootenay House and the MIDAS ‘M’, not to mention connecting local entrepreneurs and startups to one another as well as the variety of valuable resources that will assist them on their entrepreneurial journeys, KAST hosted arguably one of the best “eat and greets” of the Summit. It was a huge turnout and the perfect opportunity for our regional entrepreneurs, tech workers, and business people to connect with one another but other likeminded individuals and businesspeople from around the province and beyond. We want to give HUGE thanks to the incredible event sponsors, without whom this outstanding event couldn’t have been possible: Imagine Kootenay, BC Craft Co., Fernie Alpine Resort, Isosceles, Selkirk College, Pixel Cents Software, Nelson Kootenay Lake Tourism, Retallack, Big Magic Design, and Whitewater Ski Resort. http://kast.com/wp-content/uploads/2019/03/Tracy-Connery-Photography-KAST-MIDAS-BCTECH-Summit-2019-Commercial-Photography_21.jpg 1669 2500 Tracy Connery http://kast.com/wp-content/uploads/2019/03/KASTLogo-2019-white-lo-1.png Tracy Connery2019-03-13 09:08:502019-03-13 09:08:50#BCTECH Summit and Kootenay House Day 1! Kootenay House at #BCTECH Summit! 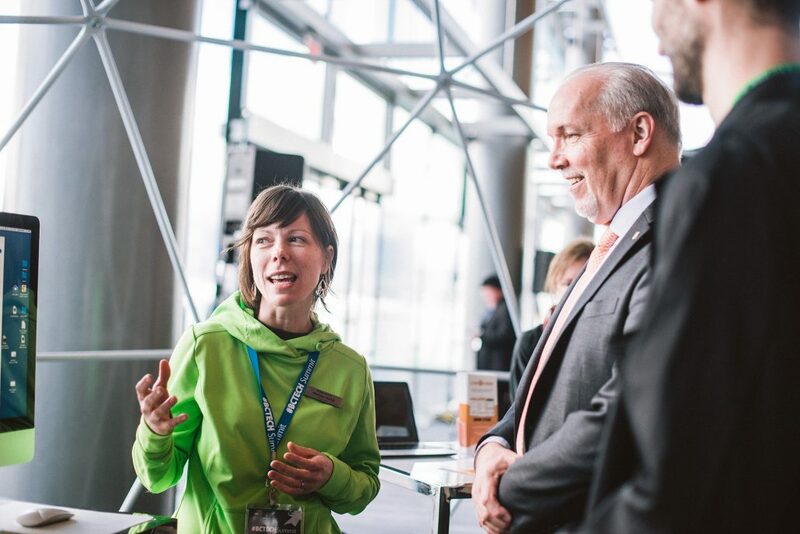 Entrepreneurs, businesses, and startups will be in Vancouver en masse next week for #BCTECH Summit where the Kootenays will see more representation than ever! 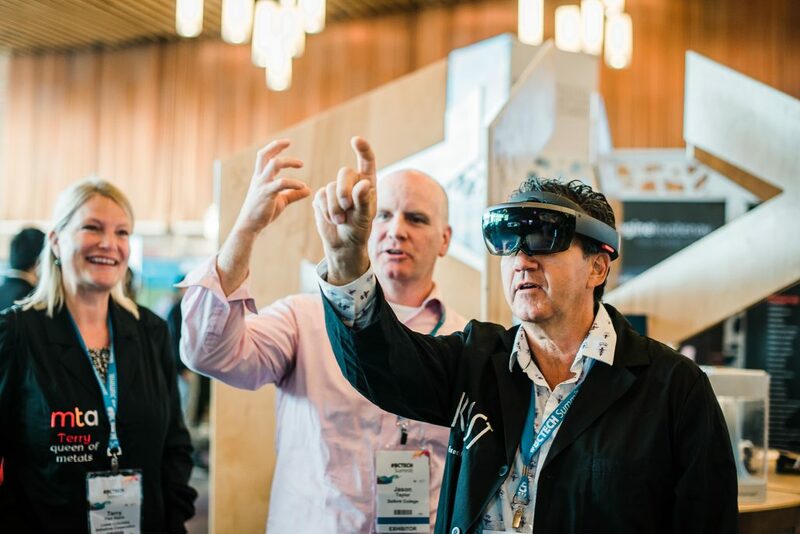 We are so proud of the fact that the Kootenays are going to be taking this year’s #BCTECH Summit by storm, showcasing and promoting how technology and innovation have taken hold throughout the region. In preparation for Kootenay record attendance, KAST is proud to be co-sponsoring the Kootenay House with the Columbia Basin Trust, the Nelson and Area Economic Development Partnership (NAEDP) and Lower Columbia Initiatives Corporation (Metal Tech Alley). The House will feature 5 Kootenay businesses in a custom geodesic dome for the duration of the conference: Rossland based ThoughtExchange; Cronometer from Revelstoke; Pixel Cents out of Nelson; Kodiak Measurement Services and Selkirk College from Nelson and Castlegar, respectively; and the new Columbia Lake Technology Center from Canal Flats. Identify yourself to KAST as a proud Kootenarian and we’ll get you a #Kootenaytech T-shirt and drink tickets for the Kootenay House Party so you can share how awesome the Kootenays are with other attendees. Attendees of the conference can attend the Kootenay House Party on Tuesday, March 12 at 5-7pm. Join KAST plus over 40 Kootenay technology companies attending the summit this year—for a special “Eat & Greet” featuring complimentary appetizers, Kootenay craft beers, swag, and music! Look for proud Kootenarians sporting their #Kootenaytech t-shirts and discover why they think the Kootenays is the best place to live, work, study and play! We want to give huge thanks to our great event sponsors: Imagine Kootenay, BC Craft Co., Fernie Alpine Resort, Isosceles, Selkirk College, Pixel Cents Software, Nelson Kootenay Lake Tourism, Retallack, Big Magic Design, and Whitewater Ski Resort. Visit with KAST at the MIDAS M! KAST will be on the ground connecting Kootenay companies and entrepreneurs to investors, resources and other key people and organizations. Find us at the MIDAS M in the marketplace & let us know what you’re looking for. Don’t miss Don Freschi’s talk on building tech companies here in the Kootenays on Wednesday, 2-3 pm. http://kast.com/wp-content/uploads/2019/03/kfbgs7ibfzeph7nov8p9.png 609 1382 Tracy Connery http://kast.com/wp-content/uploads/2019/03/KASTLogo-2019-white-lo-1.png Tracy Connery2019-03-05 08:01:362019-03-08 07:23:41Kootenay House at #BCTECH Summit! 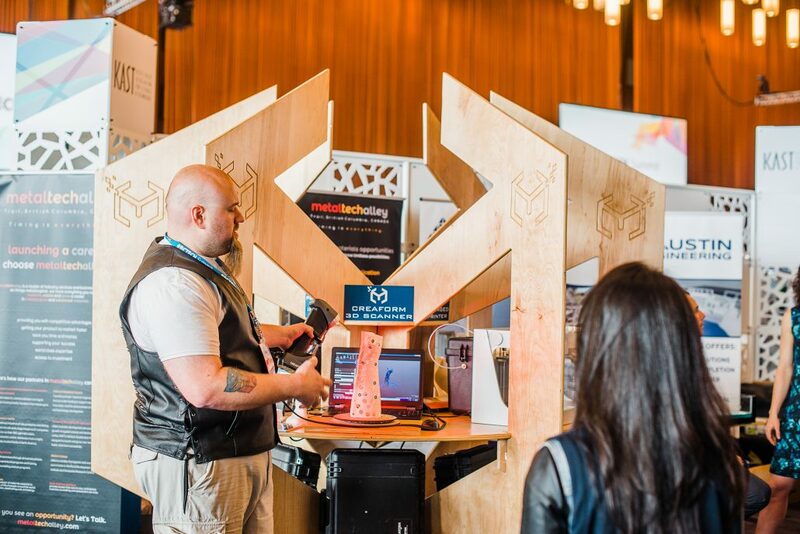 Pitch your solution to an Innovation Challenge at #BCTECH Summit! Hosted by Innovate BC, the Ministry of Agriculture, Foresight Cleantech Accelerator Centre, Vancouver Economic Commission and the Ministry of Citizens’ Services, the Innovation Challenges are a new #BCTECHSummit activity where large organizations will pitch their specific pain points for an audience of startups, innovators, and researchers. Following a series of engaging pitches, presenters will be hosting scheduled meetings with the goal of jumpstarting deals with companies that have the potential to solve problems impacting people and communities across B.C. and beyond. The deadline to book follow-up meetings is Tuesday, February 26. If you have any questions, please contact Maggie Chan at mchan@innovatebc.ca. B.C.’s Ministry of Agriculture is seeking technology solutions that serve the needs of the province’s $14.2 billion agriculture and seafood industries. Targeted solutions include, but are not limited to, technologies for food and beverage processing, traceability, precision agriculture, and bioproducts. Learn more! Translink, Seattle’s Sound Transit, City of Richmond, and Smart Kootenays are buying innovations for improving mobility for citizens through connected technology and data. Targeted products include, but are not limited to, technologies for station passenger analytics, wayfinding for the deaf and blind, and data consolidation tools to support predictive analytics. B.C.’s Ministry of Environment and Climate Change Strategy, Ministry of Health, Ministry of Education, Ministry of Indigenous Relations & Reconciliation, and B.C. Wildfire Service will be presenting challenges and open procurement opportunities benefiting citizens across B.C. Targeted innovations include, but are not limited to, technologies for tracking vehicle kilometres, a digital patient gateway, and scholarship delivery digitization. Shell Hydrogen and the B.C. Ministry of Transportation & Infrastructure are looking for innovations that will advance environmental sustainability and reduce greenhouse gas emissions. Big investment in Canada’s innovation sector under the Innovation Superclusters Initiative to boost the BC and Canadian economies. 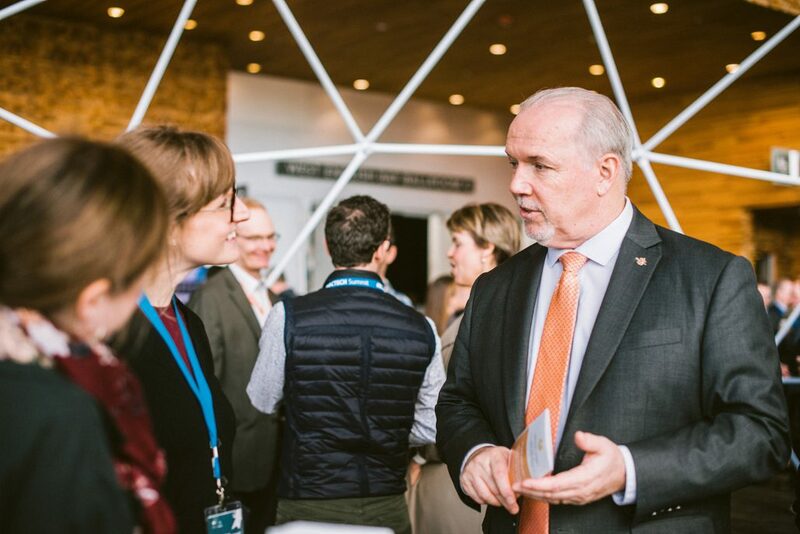 $950 million is being invested by the Government of Canada under the Innovation Superclusters Initiative, an ambitious strategy to energize B.C. and Canada’s economy. 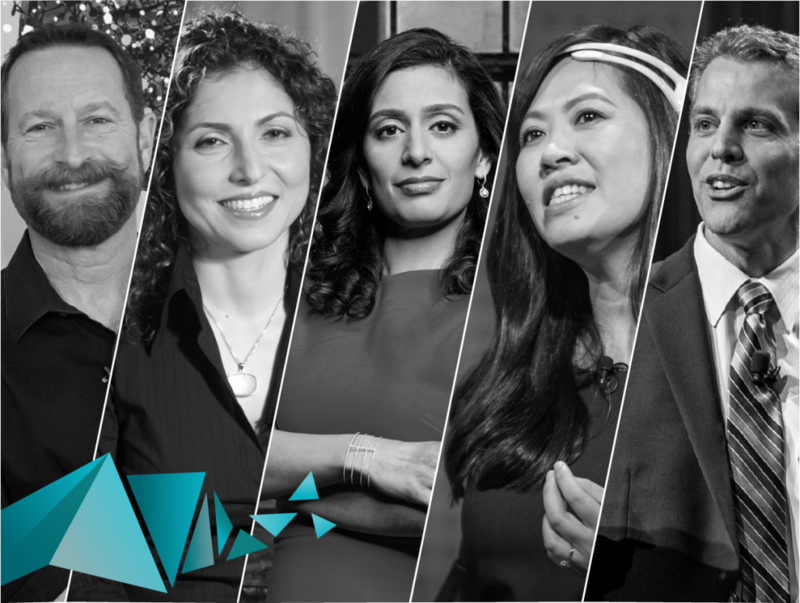 Next month, the CEOs of all five of the country’s business-led Innovation Superclusters are set to appear together for the first time ever at the #BCTECHSummit. Read more about Canada’s Innovation Superclusters below and then register to learn how you can get involved with and benefit from innovative projects designed to produce world-class innovation, transform industries and supercharge our economy. When startups, large companies, academic institutions and not-for-profit organizations come together to generate bold ideas, Canadians benefit from more well-paying jobs, groundbreaking research and a world-leading innovation economy that creates global market leaders. The Digital Technology Supercluster will use bigger, better datasets and cutting-edge applications of augmented reality, cloud computing and machine learning to improve service delivery in the natural resources, precision health and manufacturing sectors. The Protein Industries Supercluster will use plant genomics and novel processing technology to increase the value of key Canadian crops, making Canada a leading source for plant proteins and, ultimately, feed the world. The AI-Powered Supply Chains Supercluster (SCALE.AI) will bring the retail, manufacturing, transportation, infrastructure, and information and communications technology sectors together to build intelligent supply chains through artificial intelligence and robotics. 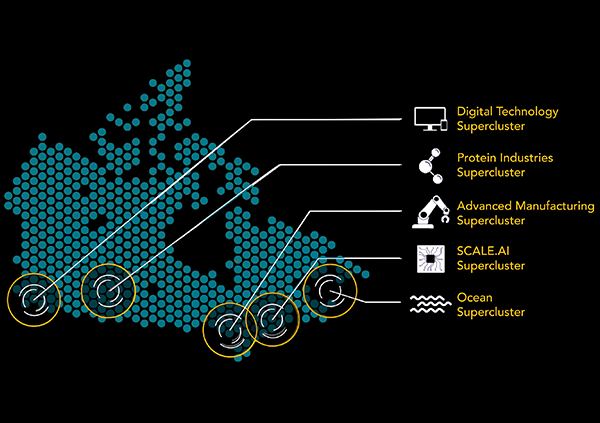 The Ocean Supercluster will harness emerging technologies to strengthen Canada’s ocean industries—industries like marine renewable energy, fisheries, aquaculture, oil and gas, defence, shipbuilding, and transportation. The Advanced Manufacturing Supercluster will build up next-generation manufacturing capabilities, incorporating technologies like advanced robotics and 3D printing—making Canada a world manufacturing leader in the economy of tomorrow. The #BCTECHSummit mobile app is here! You already know about all the speakers, sessions, and sponsors that you’ll see at the event, so now it’s time for you to start making connections and creating your schedule. 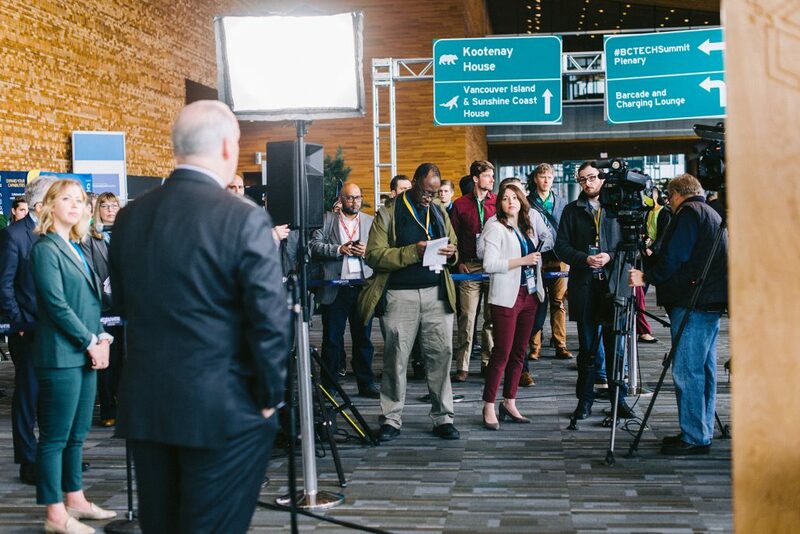 Conveniently access everything you need to know about #BCTECH Summit 2019. Enhance your event experience by using the app to view the entire program, connect with other attendees and more — right at your fingertips! This year’s keynote speakers are thought-leaders that represent world-class brands in every industry. This is your opportunity to access their knowledge, experience, and influence. The world is changing at an unprecedented rate. KAST is excited to partner with the #BCTECHSummit to explore emerging technologies and ways to solve new challenges today’s world faces. Join us! Basin-based businesses: the deadline to APPLY FOR UP TO $1,000 to offset expenses from the Columbia Basin Trust is MIDNIGHT on FEBRUARY 4, 2019. 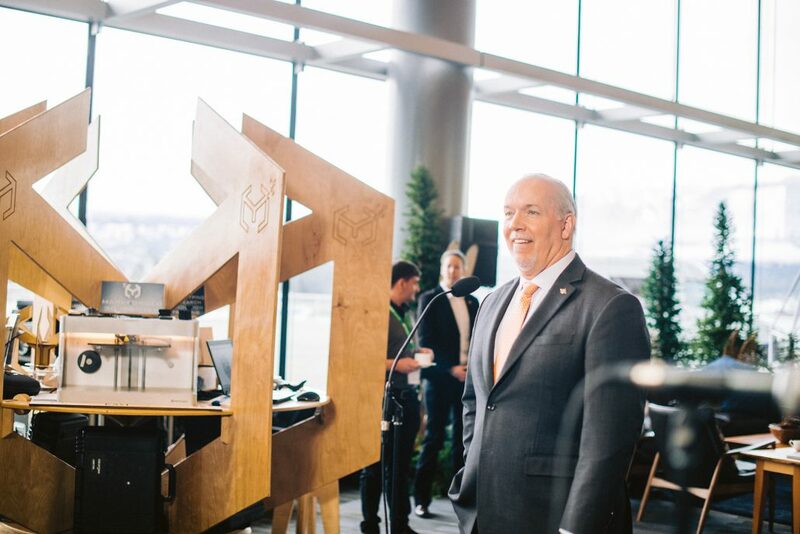 The #BCTECHSummit takes B.C.’s innovation economy and elevates it to a global scale by bringing together business leaders and technology experts all across B.C. and around the world to exchange ideas, insights, and opportunities. Having worked for the Walt Disney Company for some 25 years, Duncan Wardle now serves as an independent innovation and design thinking consultant, helping companies around the globe embed a culture of innovation and creativity across their organizations, delivering a series of keynotes, training workshops, and leading innovation projects. His unique Design Thinking process helps people capture unlikely connections, leading to both fresh thinking and revolutionary ideas. Most recently Duncan was Head of Innovation and Creativity for the Walt Disney Company, where he helped support franchises such as Lucas Films, Pixar, Marvel, Disney Imagineering, Disney Parks, and ESPN. Working as an innovation catalyst and cultural change agent, he helped each line of business increase their capacity to innovate at scale. Anousheh Ansari is the CEO of the XPRIZE Foundation, the world’s leader in designing and operating incentive competitions to solve humanity’s grand challenges. A serial tech entrepreneur and an active proponent of world-changing technologies, Ansari, along with her family, sponsored XPRIZE’S first competition, a $10 million initiative that ignited a new era for commercial spaceflight. Ansari is the first female private space explorer, first astronaut of Iranian descent, the first Muslim woman in space, and fourth private explorer to visit space. Previously, Ansari served as the CEO of Prodea Systems, a leading Internet of Things (IoT) technology firm she co-founded in 2006. Ansari has also co-funded The Billion Dollar Fund for Women, with a goal of investing $1 billion in women-founded companies by 2020. Prior to founding Prodea Systems, Anousheh served as co-founder, chief executive officer and chairman of the board for Telecom Technologies, Inc. After earning three key U.S. patents and growing the company to 250 employees with 100 percent sequential growth year over year since inception, the company successfully merged with Sonus Networks, Inc., a provider of IP-based voice infrastructure products. Anousheh was recognized as a Young Global leader and continues to serve the World Economic Forum as a member of Future Global Council. Dragon’s Den judge Manjit Minhas has been able to do what few ever thought possible—break into the notoriously competitive and notoriously male-dominated beer and spirits industry and grow her company to the 10th largest brewery in the world. She’s been profiled in Maclean’s, The Globe and Mail and on The National and was recently named one of Canada’s Top 40 Under 40, a distinction honouring outstanding Canadian leaders. Minhas started Mountain Crest Liquors Inc. (MCLI) at the age of 19 in Alberta. In late 2002 she entered the beer market with Mountain Crest Classic Lager. It quickly became the first successful beer company to enter Canada in decades. MCLI is now making waves internationally, producing, developing, and marketing over 90 brands, and has served over 6 billion pints of beer. She is also the creator of Uptown Girl, a beer that is marketed and made exclusively for women. In 2006, Minhas and her brother Ravinder, purchased the second oldest brewery in the United States and renamed it The Minhas Craft Brewery, officially marking them as the Youngest Brewery Owners in The World. Their quality beers are shipped across the USA, Canada and overseas. The siblings opened The Minhas Micro Brewery in Calgary in June 2012, from which they make world-class craft beers and specialty beers such as a gluten-free beer. Tan Le is a top innovation and business speaker, technology entrepreneur, and the Founder and CEO of EMOTIV. She has won numerous awards, including being named Young Australian of the Year in 1998, voted one of Australia’s 30 Most Successful Women Under 30, chosen by Fast Company’s as one of the Most Influential Women in Technology in 2010, and picked by Forbes’ for 50 Names You Need to Know in 2011. Her company EMOTIV is a leader in brain wearables, which offers access to advanced brain monitoring and cognitive assessment technologies. She currently serves on the Board of Stewards on Shaping the Future of Information and Entertainment of the World Economic Forum. Eric O’Neill is a cyber-security keynote speaker and expert, former FBI counterterrorism and counterintelligence operative, and was the inspiration for the film Breach. In 2001, Eric helped capture the most notorious spy in United States history, Robert Phillip Hanssen. Eric is also the founder of The Georgetown Group, a premier investigative and security services firm, and a National Security Strategist for Carbon Black, the leader in next-generation endpoint security.